Had Raeder and his equally adept subordinates been left to get on with what they did best, and had they been allowed the time to do it, there is no doubt that the rebuilt Kriegsmarine would have presented a serious threat to the supremacy of the Royal Navy. 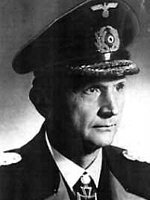 As it happened, the war came far too soon for Raeder, who found his force underequipped for such a task (he had estimated that the Kriegsmarine would have reached optimum strength by 1948, under the constraints of the radical fleet building programme, the Z-Plan). The operation was made even more difficult by the constant interference of Hitler, a man who knew absolutely nothing about Naval strategy and tactics, despite appearances to the contrary. Like a horse being led around by a monkey, Raeder could do little as Hitler pursued his dream of building heavy "show" battleships, while the stuff of the cutting edge - the U-boats and the lighter, faster vessels - were more often than not given second priority. The leaders of the Kriegsmarine. Left: Grossadmiral Erich Raeder, chief until 1943. Right: Grossadmiral Karl Dönitz, chief until 1945, when he was appointed Germany's second and last Führer. Things were not helped by the fact that Hermann Gring, the chief of the Luftwaffe, constantly got in the way of developments. Such inter-departmental bickering and petty self-aggrandisement on the part of many in the upper echelons of command, not to say Hitler's grandiose plans, was to blight Germany's effort during the entire war, with professionals like Raeder, Dönitz and many others constantly being obstructed. Dönitz had suggested that to defeat Great Britain he would have wanted a fleet of at least three hundred U-boats; by the time daggers were drawn in September 1939, he had less than sixty. In his post-war memoirs, Dönitz argued that at the time of the declaration of war in 1939 he had seen the Kriegsmarine as being akin to something resembling a "torso without limbs", so poorly equipped that it could do "no more than subject the enemy to a few odd pin-pricks". (Dönitz, Memoirs: Ten Years and Twenty Days). In sheer statistical terms, the German surface fleet was outnumbered ten to one by that of the Royal Navy. As it happened, the skill and sheer dedication of those in the service were to - initially at least - prove Dönitz wrong, but as time wore on and the overall weaknesses of the Kriegsmarine became more apparent, there can be no doubt that the Grand Admiral's initial thoughts were vindicated. Despite the pessimism of its commanders such as Dönitz, the war began surprisingly well for the Kriegsmarine, with the U-boat arm in particular wreaking havoc on Allied shipping in the North Atlantic sector. Within weeks of war being declared, the aces had started to emerge, Günther Prien among them. Following the attack on the HMS Royal Oak by Prien at Scapa Flow, British morale was at a low ebb, and that of the Kriegsmarine was at an all-time high. This was soon followed by a number of stunning campaigns, among them the dramatic success of the invasion of Norway, where Naval forces were instrumental. The period between 1939 and 1940 was called the "happy time" by the U-boat crews - with no organised escorts, the Allied North Atlantic shipping routes offered easy pickings. This success was to gradually diminish, as the chickens came home to roost for the German leadership. By the late spring of 1941, many of the leading aces were either lost at sea, captured or dead, including Prien. Although a number of able U-boat commanders were being turned out of the cadet schools, the turnover was simply not sufficient to cope with the now reorganised convoy system, protected by high-quality destroyers armed with the dreaded ASDIC detection system. And while these new commanders were to a man as brave and dedicated as their predecessors, they simply did not have the necessary experience - the sort of experience that only years of training can bring about - to maintain the pressure on the convoys and throttle the Allied supply line. During the course of 1941, the "happy time" slowly came to an end, both for the U-boat arm and the Kriegsmarine in general, which saw its prized possession, the heavy battleship Bismarck, go down with over two-thousand hands on board on 27 May 1941 at the end of what was one of the most famous battles in naval history. 27 May was a black day for the Kriegsmarine, which from that point on became something of a peripheral force. Already small compared to the Royal Navy, the Kriegsmarine had been damaged to such an extent that it subsided as a genuine challenge. The Royal Navy could easily sustain the loss of a battleship or two, morale-damaging as it was; the Kriegsmarine could not. Quite simply, the loss of the Bismarck bordered on the catastrophic for Raeder and his colleagues. The legendary heavy battleship Bismarck, the loss of which in May 1941 precipitated the decline of the already small Kriegsmarine as an effective fighting force. From that point on the Kriegsmarine went through the motions, and was more often than not employed in a defensive role. The sole exception was the U-boat arm, which despite the constant danger to its crews continued to eke out results, albeit with heavy losses in the face of rapidly advancing Allied technology and the cracking of the Enigma code system. 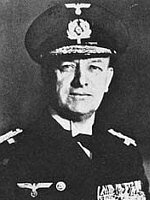 The success of the U-boat arm - relatively speaking, when one considers that of the forty-thousand or so men who set out to sea only a quarter returned - had caught the attention of Hitler, who appointed Dönitz chief of the Kriegsmarine in 1943, replacing Raeder who had handed in his resignation. Dönitz, dedicated and professional to the last, remained in the post until 1945, when he became Nazi Germany's second and last leader. During his time in charge, he was able to stand up to Hitler far more effectively than Raeder had done, but by that time it was far too late to improve the fortunes of the Kriegsmarine, much less change the outcome of the war. By the time hostilities came to an end in May 1945, the once-proud Kriegsmarine had only two ships still operational.